He was born in London and educated at Winchester and Pembroke College, Oxford. After a tour of Ireland he studied medicine at Montpellier and Padua. He settled in Norwich in about 1637 - after he had already written Religio Medico. In 1671, he was knighted by Charles II when the King visited Norwich. Browne's other well known works include: Pseudodoxia Epidemica (Vulgar Errors), Hydriotaphia, Urne Burial and The Garden of Cyrus or The Quincuncial. He lived in a house which stood at the junction of Orford Yard and the Haymarket. The house was demolished in 1842 - but there is a commemorative plaque on the wall to mark the site. A mantle piece from the house is held by the Norwich Castle Museum. 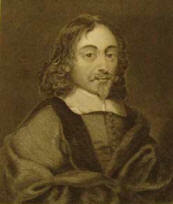 Browne was also the first person to document the Norfolk dialect. In his tract entitled: Of Languages and Particularly of the Saxon Tongue he identified words such as 'mawther' (meaning woman or girl), 'stingy' (meaning mean) and 'bunny' (meaning bruise or swelling). Some of the words he identified, however, had become obsolete by the time the Rev Robert Forby (see Fincham) wrote his famous Vocabulary of East Anglia (1830). Browne is buried in the chancel of St. Peter Mancroft Church which stands close by. In 1840 Browne's coffin was accidentally opened and his skull was removed. It was presented to the Museum of the Norfolk and Norwich Hospital - where it remained until 1922 when, after a number of casts were taken, it was returned to his grave in St. Peter Mancroft. Ironically, Browne wrote: 'to be gnawed out of our graves, to have our skulls made drinking bowls and our bones turned into pipes is a Tragical abomination'. Little did he know that this would be his own fate. Samuel Johnson wrote a biography of Browne which was published in 1756. 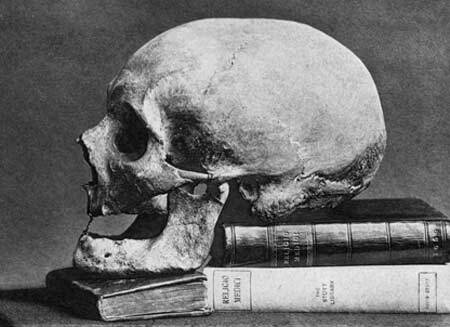 In The Rings of Saturn W.G.Sebald meditates at length upon Browne's life and work and also includes photographs of Browne's skull and of his famous 'Quincunx' pattern. In 1905 a statue to Browne was erected on Hay Hill to mark the tercentenary of his birth. The sculpture captures Browne contemplating a broken burial urn - an artefact which would have inspired his Hydriotaphia (see Great Walsingham). Norwich City Council has recently commissioned the artists Anne and Patrick Poirier to produce a 'Homage to Thomas Browne' - which features a marble eye and brain and various seats and benches which have been located in front of his statue. Browne's statue also crops up in the The Go-Between by L.P. Hartley - because it is here that Leo Colston waits for Marian on their shopping trip to Norwich. See also Great Walsingham and Felbrigg.